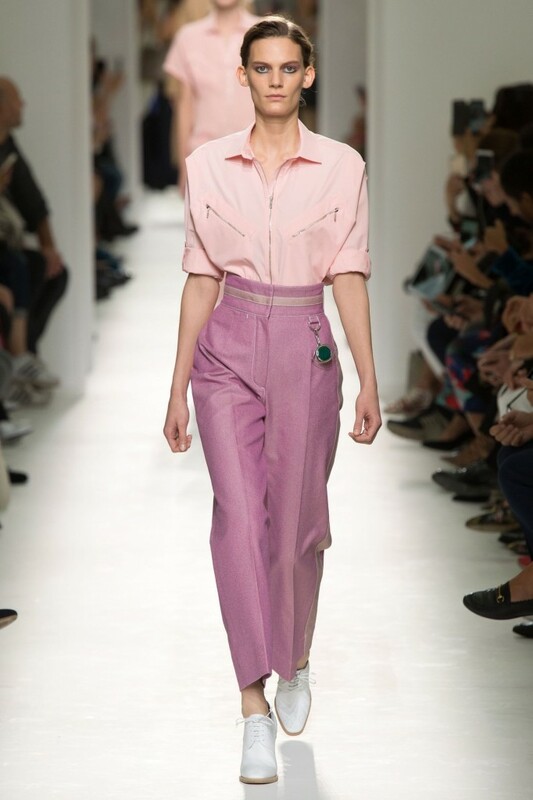 Shoulder pads – controversial among the commercial masses, but no-one does shoulder pads quite like Balenciaga. 80’s fashion isn’t exactly ranked as highly as it’s preceding decades, but this season see’s a statement but sophisticated revamp on the pads and we’d like very much to adopt them into our wardrobe full-time. Elsewhere, we’re seeing oxblood leather jackets to keep those inevitable spring showers off our shoulders, and block colour disco spandex. It ticks all of the boxes. With it being the first show to take place since the incredible Sonia Rykiel’s passing, SS17 saw a celebration of the late designer’s work. Typically Parisian, Spring/Summer plays with blues, navy’s and khaki, subtle injections of red and of course the French favourite: stripes. Ending the show in cememoration of Rykiel, models each sported the ‘Poor Boy Sweater’ which Rykiel was known for, each reading a letter from the words ‘RYKIEL FOREVER’. What’s better than a gang of models breaking out into full dance after what initially started off as a relatively normal catwalk show? Not much. Thank you Hermès for bringing back the pastels for SS17. Maison Margiela is at it again; SS17 certainly does not go gentle into that good night. This time, with a collection that is somehow futuristic space cadets meets sports-luxe, meets a Margiela day at the beach with shirt-leotard hybrids and wetsuits. It’s no less than we’d expect with Galliano at the helm. Miuccia Prada revisits a retro inspired day at the beach, with vintage-style floral swim caps, balconied bathing suits and oversized robes in 70’s palettes. What better way to end, than with Alexander McQueen. Depsite the label’s deeply inset London roots and it’s London-located studio, Alexander McQueen is one of the most highly anticipated shows of Paris Fashion Week. This season takes us back to team GB with a collection inspired by the Scottish highlands. Why? Last summer Creative Director Sarah Burton took the team out of London into the highest point of Scotland – the Shetland Isles – where they trekked through the vast landscapes and uncovered new obscure natural territories. You may have also seen the AW16 campaign, shot on the scarcely populated isle. We’re presuming the trip was pretty fruitful on the inspiration front.